Pontefract Collieries took a giant stride towards their goal of clinching a promotion play-off spot in their first season in the Evo-Stik East Division when they came from behind to win a thriller against top five rivals Tadcaster Albion. Trailing 1-0 and 2-1, Craig Parry’s men kept going and were rewarded with two goals in the last 15 minutes to clinch a 3-2 success. The victory kept Colls in second place, 10 points behind leaders Morpeth Town, but four ahead of new third-placed team Ossett United and seven ahead of Tadcaster, who stand one position outside the play-off places in sixth. 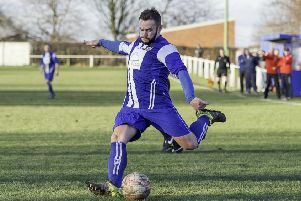 Ponte are now unbeaten in their last nine matches, but will be taking nothing for granted as last Saturday marked the beginning of a run-in that is about as difficult as it could be. After beating the team in sixth they now host fourth-placed Brighouse Town this Saturday and in April also face leaders Morpeth, Sheffield FC, who are in fifth and Ossett. On paper at least their final game looks a little easier as it at home to bottom of the table Gresley. The tricky run of matches began well, however, for Colls despite them initially finding themselves on the back foot at Tadcaster. The hosts fashioned a chance in only the second minute as Joe Lumsden fired over when well placed in the box to meet a cross. Lumsden then hit another shot wide before he made it third time lucky when putting the hosts ahead on 21 minutes, latching onto a ball over the top to flick the ball past onrushing keeper Ryan Musselwhite. Colls were shook into life and after Guest was denied by home keeper James Hodges he made it 1-1 with a smart finish from Vaughan Redford’s pull back. They almost went ahead just before half-time when strikers Eli and Redford combined well only for the alert Hodges to save. Albion began the second half the better with Lumsden heading wide from a corner. They went back in front on 55 minutes when Musselwhite was left helpless as a superb shot from 25 yards out by Will Annan arrowed in on the top corner of the net. Ponte dug in, however, and turned the game on its head in the last 15 minutes. Substitute Mikey Dunn came on to make an impact and after going on a good run into the box he was brought down. Up stepped Redford to hold his nerve from the resulting penalty and it was all square again. Two minutes later it got even better for Colls as Dunn won the ball and pulled it back for Gavin Rothery to find the back of the net with a fine shot. Tadcaster looked to hit back in a frantic finish and came close when Lumsden rounded Musselwhite only to hit the post from a difficult angle. Ponte breathed a sigh of relief and saw out the remainder for a big three points.